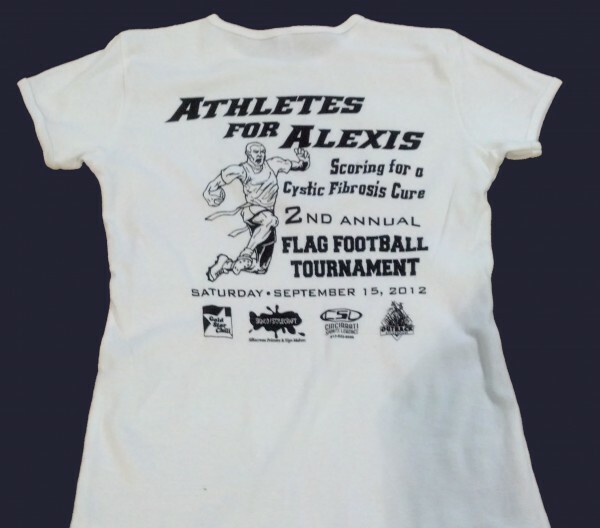 Saturday September 15th 2012, there will be a Flag Football Tournament held to raise funds for The Cystic Fibrosis Foundation and it has all been insipired by a little girl named Alexis. She is one of millions who battle Cystic Fibrosis and is hopeful for a cure! This is the 2nd year that Signco has charitably printed t-shirts for the cause that will be given to all of the players at tomorrow's game. Miller Lite provides white unisex t-shirts for the men and fitted v-neck shirts for the ladies to then be custom printed on by Signco. Custom printed tees are a small token of appreciation to those who give to the deserving cause and a great way to promote those who graviously sponsor. Good luck to Alexis and the Cystic Fibrosis Foundation on your journey to finding a cure from Signco/Stylecraft. Visit www.athletesforalexis.com for more information and if you have time...stop in and cheer for the players on Saturday!